Everyone wants an affordable printer that can do everything, and the nearest you’ll get is a multi-function inkjet printer like this. 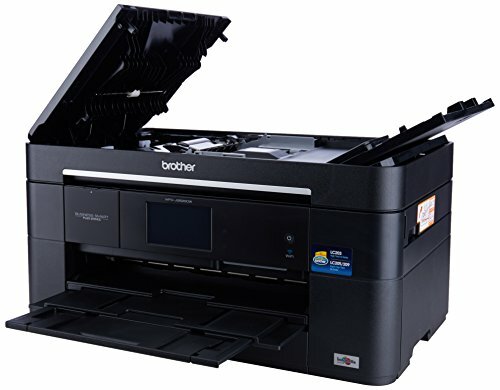 However, there’s still a distinction between models designed for home photo printing and those aimed at office documents. Read our Brother MFC J5620DW Review. This particular model signals its intentions with the ‘Business Smart Series’ logo on the front panel. But it’s far too good to be used in the office. 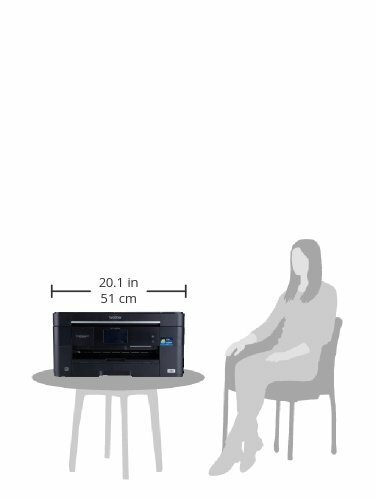 It could prove a good replacement for your home printer too, although it’s rather chunky – about the size of a large microwave oven. A bargain printer with practical design, nippy printing and great scan quality. A phone-sized color touchscreen clearly presents all the settings for printing, scanning, copying and faxing (with a phone connection), and built-in ‘apps’ give you direct access to services like Dropbox, Google Cloud Print and Microsoft OneDrive, along with options like ‘Scan to Microsoft Word’. Wi-Fi is included, and it supports direct connection (meaning you can access the printer from a wireless device even if there’s no Wi-Fi network in your house). There’s also Apple AirPrint if you need to print from iOS mobile apps. There are also slots for a USB drive, SD card or USB stick. An Ethernet socket is provided for wired networks, and there’s a USB 2.0 port for connecting to your PC. The main paper tray holds 250 sheets of A4, and there’s a separate multipurpose feed at the back (near the top for easy access) that takes a further 80, so you can keep two kinds of paper in the printer at once. You can print both sides of the paper (duplex). The rear feed incorporates a trick we’ve seen in other Brother printers: you can load up to five A3 sheets, sideways on. This is incredibly handy for the occasional poster or folded A4 document, even if it’s too fiddly for regular multiple-page A3 jobs. 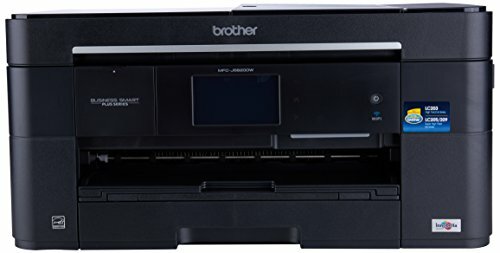 On top is a neat flap that opens to reveal an automatic document feeder (ADF) for the scanner, so you can load up to 35 pages and set them off scanning or copying. Alternatively, you can swing this up to reveal the glass scanning bed for more unwieldy content, such as books. At the front right, a hinged panel swings down to reveal the four chunky ink cartridges, which you can remove and replace in seconds – no waiting for the print head to move out of the way, as with top-loading machines. 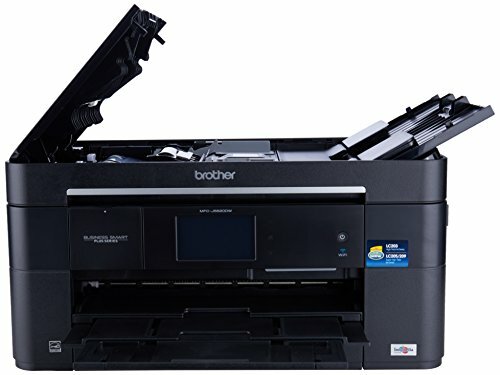 Only a few inkjet printers can match speeds of their faster laser cousins, and this isn’t one of them, but it’s fairly nippy all the same. We printed a 20-page black-and-white document in 90 seconds. Text quality was acceptable, but not as crisp as laser printing. For that, there’s a high-quality mode but – at about 1.4 pages per minute (ppm) -it’s much slower. If you’re really in a hurry, there’s an even faster mode that Brother reckons will hit 35ppm. Scanning wasn’t particularly fast, at 23 seconds for a color photocopy or just under a minute to scan a page at a sharp 300 dpi (dots per inch) over Wi-Fi, but the scan quality was excellent. If the MFC-J5620DW has one weak point, it’s the vibrancy of its color printing. Compared to more photo-oriented models, output looked a bit drab, especially on plain paper. But there was lots of detail and shading, making business documents look more professional than from rival office inkjet printers, which can be prone to banding. A full set of four high-capacity XL cartridges. That might sound a lot, but these are rated for 1,200 color and 2,400 black pages. That’s about 0.9p per black-and-white page, or 4.5p for color – very reasonable running costs for an inkjet printer. And with the MFC- J5620DW, despite Brother’s suggested retail price, it’s a bit of a bargain in the short and long term.